Up until yesterday, there had been a freaking amazing hard rock / metal festival run in Australia for the past 9 years called Soundwave. It was that good, I flew over to Sydney for the 2009, 2010, 2011, 2012 and 2014 editions. Unfortunately, yesterday Soundwave 2016 was cancelled. It wasn’t a huge surprise – anyone could figure out that there were serious challenges behind the scenes. A few days ago AJ announced this would be the last year for Soundwave, capping off a series of late / somewhat underwhelming band announcements, rumoured huge names that never quite materialised, stories popping up about tax debts from previous festivals, and so on. The big problem, ultimately, was that the line-up wasn’t of the same calibre as previous years, in terms of both headliners and overall depth. Soundwave almost became a victim of their own success – previous line-ups had been so consistently, absurdly good, it made it that much more starkly obvious when this year’s line-up came up short of that high benchmark. There’s a very good reason for how the line-up ended up, though. Remember, most major rock/metal bands are from the US, and therefore expect to get paid in US Dollars – with a few from the UK. 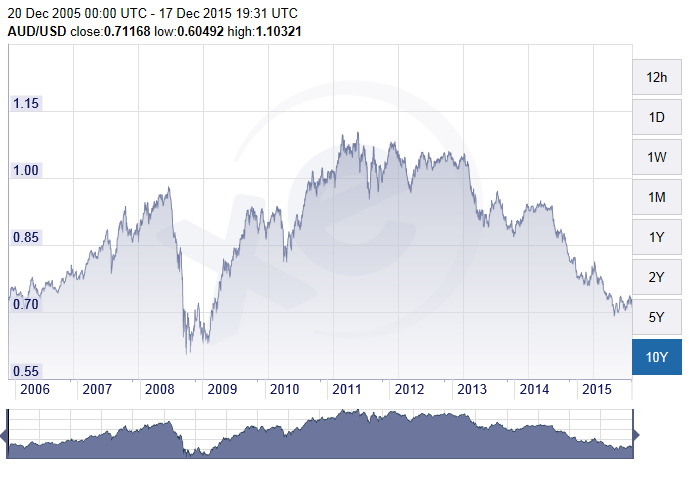 From mid-2009 onwards until mid-2014, the AUD was very strong against the USD. In fact, the AUD/USD rate was pretty much over 0.9 the whole time apart from a couple of brief lulls. It was over 1.0 for most of 2011 and 2012. And then, in mid-2014, the Aussie dollar tanked – dropping from 0.93 in September 2014 to 0.70 a year later. All of a sudden, a band that costs US$100k – which at 1:1 would’ve cost AU$100k – now costs AU$140k at 0.7:1. Any operation that had its main cost line go up 40% in the space of 2 years is going to have a serious problem (that would probably sink all but the most profitable businesses). So the only solution is just to have less bands, and hence the somewhat diminished lineup this year – with no really big headliner, but some solid draws nevertheless (Deftones, Disturbed, etc.) and a genuine wildcard in Metal Allegiance. The (comparatively) weak line-up meant the punters didn’t front up early on like they have in previous years, which creates a fairly vicious cycle – those weak initial sales will naturally make other bands, who might be big drawcards, reluctant to sign up. My suspicion is Soundwave’s approach was always to use a big first announcement to drive sales and publicity, to therefore fuel subsequent signings for the second and third announcements – essentially allowing them to give the audience the biggest and best selection of bands they could possibly get. Up until this year it worked admirably. Even under these challenging circumstances, AJ was clearly working furiously up until the ship sank to try and get a big name to rescue proceedings. There was some speculation it could’ve been Guns N Roses with the original line-up – that might have done it. It turned out it was Rage Against the Machine. Expecting a band who hasn’t played a show in four years to reunite for a tour on six weeks’ notice was probably pretty optimistic – and I’m not totally sure they alone would’ve saved the day – but hell it was worth a go. What I actually find really disappointing about the demise of Soundwave is not so much the fact it’s over, or the way it ended, but the way some punters have reacted. “People on social media” have been incredibly quick to put the boot into AJ, Soundwave, and this year’s line-up, with some celebrating the festival’s cancellation. Seriously, if you are going to blame anyone, blame the governments of China and Australia. The former, because the tanking Chinese economy has dried up demand for Australia’s mining exports, which is largely what has caused the AUD to tank. The latter, because they clearly did not have a plan B for the economy in the event that mining tanked. Frankly, you guys do not know how good you have had it. Year after year, Soundwave churned out a festival that was comparable to many of the huge festivals in the US and Europe. We’re talking about the likes of Rock on the Range, Sonisphere, Download – huge names that fans in Australia and New Zealand would dream of being able to go to maybe once in a lifetime. Those festivals have a potential catchment based on populations well into the hundreds of millions of people; AJ and Soundwave gave us the same thing in our backyard of 25 million or so. So many festivals down under have involved filling in chunks of the day between a few relatively decent bands; at Soundwave the problem was normally that you wanted to see more bands than you possibly could and hence had to manage the clashes. And of course, we didn’t just get the festival, we got the deluge of sideshows that came with it – in fact, a lot of bands took the opportunity to come over the ditch to New Zealand, either for their own shows, or as part of Westfest (which is probably now also in a terminal state). I got to see Clutch, my favourite band in the world, play in the freakin’ Kings Arms in Auckland! It would’ve been nice to have the once-mighty Soundwave go out with a huge bang, rather than have it crawl into a heap while a bunch of lame internet trolls and keyboard warriors put the boot in, whilst the fight over refunds potentially gets messy. But that wasn’t to be, and unfortunately idiots are going to behave like idiots. But I, for one, am pretty bloody grateful for everything Soundwave has given me. Not just the chance to see a lot of great bands, but some great memories for both myself and my primary concert-going co-conspirator. So thanks, AJ Maddah, for everything that you did for rock and metal fans down under, through Soundwave, and Soundwave Touring - over the past decade it's hard to imagine anyone who's done more. They had an early afternoon set, on the metal (side) stage. They played only six songs. But somehow, this was one of the most intense, powerful festival sets I’ve ever seen a band play. It was like they distilled an entire show’s worth of energy into just six tracks, with every single member of the band holding nothing back. It was brutal, it was uncompromising, and it has me incredibly excited for their full headline set in Auckland in March next year. I’d waited ten years to see Sevendust live, and somehow they managed to completely fulfil expectations with just a short festival set. AIC had recently reformed, with new singer/guitarist William DuVall. Here was a band I thought I would never, ever get a chance to see perform live, with one of my most respected/admired musicians in Jerry Cantrell. And I found myself right up the front, right on the barrier, watching a rejuvenated, energetic AIC rip through a stunning set of classic tracks – Man in the Box, Nutshell, Rooster and No Excuses, plus big personal favourites like Rain When I Die and Dam That River. This was my first Soundwave experience; the bar had been set very, very high. In exactly the same category as AIC – “bands that I never thought I’d get to see because they’d split up”. Faith No More were everything I’d hoped for and a lot more. They came dressed in lounge suits with lavish floral arrangements on stage, and had a great setlist including a few hidden gems like Surprise! You’re Dead, The Gentle Art of Making Enemies. They finished with We Care A Lot – probably the single best track they could have finished a set with. Throughout, Mike Patton’s presence and vocal ability was nothing less than captivating. He plays with the crowd much like a cat toys with a mouse – and frankly it was a reminder of how few decent front men have emerged in the past decade or so. The exception to the above observation about the dearth of front men in recent times is one Myles Kennedy, singer/guitarist for Alter Bridge. Although, one great thing about Alter Bridge is what a tight unit they are – the way that Kennedy, Brian Marshall, Mark Tremonti and Scott Phillips just continually riff off one another on stage. This time around they had an early afternoon main stage set; not ideal, but they sure left everything out there on stage. It’s impossible not to like a band with such great songs and so much enthusiasm for the songs, the crowd – Mark Tremonti in particular seems to perform with the sort of raw, unabashed energy of a kid (or mildly drunk adult) rocking out to Guitar Hero. The scary thing about this band – they keep on getting better. The step-up from their previous Soundwave set to this one was huge. If I had to pick one Soundwave highlight, this would be it. It was 9pm, at the end of a long, hot, messy day. Machine Head were up on the metal side stage, playing against System of a Down, one of the main headliners. For the next 60 minutes, they put on a performance that I’ve only seen rivalled once since – and that was by them, earlier this year. Those songs, that energy, just wash over the crowd, and totally envelop you. And there’s this continual call and response between band and crowd, that just continually pushes the intensity and the energy level up, and up, and up. This was the first, glorious time I saw Machine Head live; now I consider them the greatest live band in the world today. This looks like an exciting and entertaining event full of music and fun.I hope you had a great time and enjoyed the evening. Looking forward to more of your posts.